Definition at line 37 of file tm-modules.h. Definition at line 32 of file tm-modules.h. Referenced by NoNFLOGSupportExit(), NoWinDivertSupportExit(), SCProfilingPrintPacketProfile(), TmModuleDecodeAFPRegister(), TmModuleDecodeErfDagRegister(), TmModuleDecodeErfFileRegister(), TmModuleDecodeIPFWRegister(), TmModuleDecodeNetmapRegister(), TmModuleDecodeNFQRegister(), TmModuleDecodePcapFileRegister(), TmModuleDecodePcapRegister(), TmModuleDecodePfringRegister(), TmModuleDecodeWinDivertRegister(), and TmModuleNapatechDecodeRegister(). Definition at line 34 of file tm-modules.h. Referenced by DetectEngineInspectBufferGeneric(), PacketPoolPostRunmodes(), and TmModuleFlowWorkerRegister(). Definition at line 35 of file tm-modules.h. Definition at line 36 of file tm-modules.h. Referenced by TmModuleBypassedFlowManagerRegister(), TmModuleDetectLoaderRegister(), TmModuleFlowManagerRegister(), and TmModuleFlowRecyclerRegister(). Definition at line 31 of file tm-modules.h. Referenced by DetectEngineInspectBufferGeneric(), NoNFLOGSupportExit(), NoWinDivertSupportExit(), SCProfilingPrintPacketProfile(), TmModuleDecodeNetmapRegister(), TmModuleNapatechStreamRegister(), TmModuleReceiveAFPRegister(), TmModuleReceiveErfDagRegister(), TmModuleReceiveErfFileRegister(), TmModuleReceiveIPFWRegister(), TmModuleReceiveNetmapRegister(), TmModuleReceiveNFQRegister(), TmModuleReceivePcapFileRegister(), TmModuleReceivePcapRegister(), TmModuleReceivePfringRegister(), TmModuleReceiveWinDivertRegister(), and TmThreadDisableReceiveThreads(). Definition at line 33 of file tm-modules.h. Structure that output modules use to maintain private data. Definition at line 40 of file tm-modules.h. Definition at line 41 of file tm-modules.h. Definition at line 39 of file tm-modules.h. Definition at line 33 of file tm-modules.c. References TmModule_::Func, TmModule_::name, SCLogDebug, ThreadVars_::t, tmm_modules, and TMM_SIZE. id Id of the TM Module to return. Pointer of the module to be returned if available; NULL if unavailable. Definition at line 88 of file tm-modules.c. 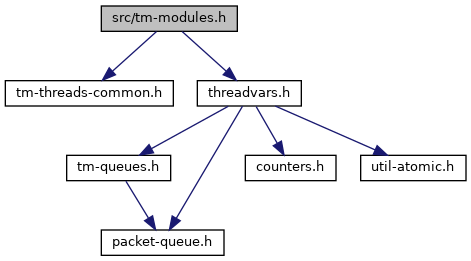 References ThreadVars_::id, SC_ERR_TM_MODULES_ERROR, SCLogError, tmm_modules, and TMM_SIZE. Referenced by DetectEngineInspectBufferGeneric(), TmThreadDisableReceiveThreads(), and TmThreadGetFirstTmSlotForPartialPattern(). Definition at line 51 of file tm-modules.c. References TmModule_::name, ThreadVars_::t, tmm_modules, and TMM_SIZE. 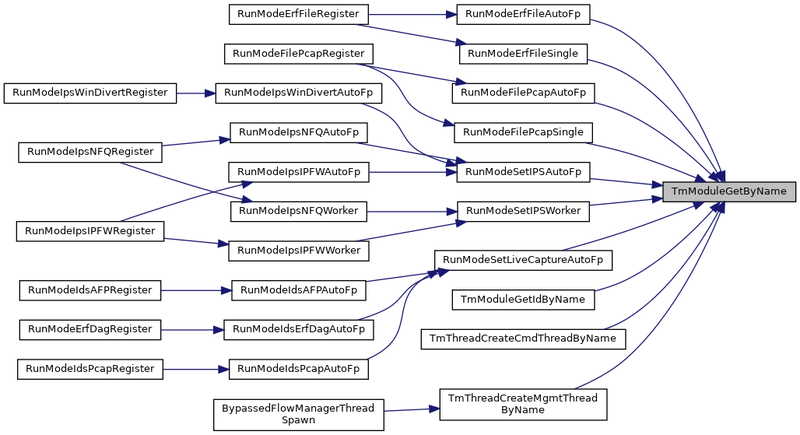 Referenced by RunModeErfFileAutoFp(), RunModeErfFileSingle(), RunModeFilePcapAutoFp(), RunModeFilePcapSingle(), RunModeSetIPSAutoFp(), RunModeSetIPSWorker(), RunModeSetLiveCaptureAutoFp(), TmModuleGetIdByName(), TmThreadCreateCmdThreadByName(), and TmThreadCreateMgmtThreadByName(). Definition at line 72 of file tm-modules.c. tm Pointer to the TM Module. id of the TM Module if available; -1 if unavailable. Definition at line 107 of file tm-modules.c. Referenced by TmModuleGetIdByName(), and TmSlotSetFuncAppend(). Definition at line 163 of file tm-modules.c. References coverage_unittests, g_ut_covered, g_ut_modules, TmModule_::name, TmModule_::RegisterTests, SC_WARN_NO_UNITTESTS, SCLogWarning, ThreadVars_::t, tmm_modules, and TMM_SIZE. Definition at line 144 of file tm-modules.c. References TmModule_::DeInit, TmModule_::name, ThreadVars_::t, tmm_modules, and TMM_SIZE. Definition at line 126 of file tm-modules.c. References TmModule_::Init, TmModule_::name, ThreadVars_::t, tmm_modules, and TMM_SIZE. Maps the TmmId, to its string equivalent. Definition at line 199 of file tm-modules.c. References CASE_CODE, TMM_ALERTPCAPINFO, TMM_BYPASSEDFLOWMANAGER, TMM_DECODEAFP, TMM_DECODEERFDAG, TMM_DECODEERFFILE, TMM_DECODEIPFW, TMM_DECODENAPATECH, TMM_DECODENETMAP, TMM_DECODENFLOG, TMM_DECODENFQ, TMM_DECODEPCAP, TMM_DECODEPCAPFILE, TMM_DECODEPFRING, TMM_DECODEWINDIVERT, TMM_DETECTLOADER, TMM_FLOWMANAGER, TMM_FLOWRECYCLER, TMM_FLOWWORKER, TMM_RECEIVEAFP, TMM_RECEIVEERFDAG, TMM_RECEIVEERFFILE, TMM_RECEIVEIPFW, TMM_RECEIVENAPATECH, TMM_RECEIVENETMAP, TMM_RECEIVENFLOG, TMM_RECEIVENFQ, TMM_RECEIVEPCAP, TMM_RECEIVEPCAPFILE, TMM_RECEIVEPFRING, TMM_RECEIVEWINDIVERT, TMM_RESPONDREJECT, TMM_SIZE, TMM_STATSLOGGER, TMM_UNIXMANAGER, TMM_VERDICTIPFW, TMM_VERDICTNFQ, and TMM_VERDICTWINDIVERT. Definition at line 73 of file tm-modules.h. Referenced by NoNFLOGSupportExit(), NoWinDivertSupportExit(), RegisterAllModules(), SCProfilingDumpPacketStats(), SCProfilingPrintPacketProfile(), StatsSetUI64(), TmModuleBypassedFlowManagerRegister(), TmModuleDebugList(), TmModuleDecodeAFPRegister(), TmModuleDecodeErfDagRegister(), TmModuleDecodeErfFileRegister(), TmModuleDecodeIPFWRegister(), TmModuleDecodeNetmapRegister(), TmModuleDecodeNFLOGRegister(), TmModuleDecodeNFQRegister(), TmModuleDecodePcapFileRegister(), TmModuleDecodePcapRegister(), TmModuleDecodePfringRegister(), TmModuleDecodeWinDivertRegister(), TmModuleDetectLoaderRegister(), TmModuleFlowManagerRegister(), TmModuleFlowRecyclerRegister(), TmModuleFlowWorkerRegister(), TmModuleGetById(), TmModuleGetByName(), TmModuleGetIDForTM(), TmModuleNapatechDecodeRegister(), TmModuleNapatechStreamRegister(), TmModuleReceiveAFPRegister(), TmModuleReceiveErfDagRegister(), TmModuleReceiveErfFileRegister(), TmModuleReceiveIPFWRegister(), TmModuleReceiveNetmapRegister(), TmModuleReceiveNFLOGRegister(), TmModuleReceiveNFQRegister(), TmModuleReceivePcapFileRegister(), TmModuleReceivePcapRegister(), TmModuleReceivePfringRegister(), TmModuleReceiveWinDivertRegister(), TmModuleRegisterTests(), TmModuleRespondRejectRegister(), TmModuleRunDeInit(), TmModuleRunInit(), TmModuleStatsLoggerRegister(), TmModuleUnixManagerRegister(), TmModuleVerdictIPFWRegister(), TmModuleVerdictNFQRegister(), and TmModuleVerdictWinDivertRegister().